Be prepared to diagnose and manage any condition you encounter in your practice! This bestselling reference gives you direct access to a complete range of full-color clinical images and patient radiographs that illustrate the differentiating characteristics of lesions in the oral and maxillofacial region. Significantly revised and updated content throughout this edition brings you the latest information on the etiology, clinical features, histopathology, treatment, and prognosis of each disease entity, as well as cutting-edge topics such as bisphosphonate osteonecrosis, the oral complications associated with methamphetamine abuse, solitary fibrous tumors, gene mutation, and plasminogen deficiency. 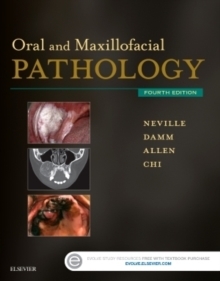 Comprehensive contemporary overview of oral and maxillofacial pathology includes a brief description of each individual lesion or pathologic condition and the kind of pathologic process that it represents, followed by a discussion of its clinical and/or radiographic presentation, histopathologic features, and its treatment and prognosis. Over 1,400 radiographs and full-color clinical photos facilitate the identification and classification of lesions and disease states. Up-to-date concepts of pathogenesis and disease management help you understand the diseases that affect oral and maxillofacial structures, formulate an accurate diagnosis, and institute proper treatment. Logical organization by body system or disease process makes it easy to look up specific conditions. Comprehensive appendix on differential diagnosis organizes disease entities according to their most prominent or identifiable clinical features, helping you find and formulate differential diagnoses. Information on forensic dentistry, methamphetamine, and gene mutations addresses some of today's leading topics in oral pathology research. Differential diagnosis case studies on the Evolve companion website include correct answers and rationales, offering more opportunities to improve your identification skills and diagnostic competency. NEW cutting-edge content includes pathologies and conditions such as localized juvenile spongiotic gingival hyperplasia, oral lesions associated with cosmetic fillers, oropharyngeal carcinomas related to human papillomavirus (HPV), IgG4-related disease and mammary analogue secretory carcinomas, Globodontia, Lobodontia, Leishmaniasis, and Xanthelasma. Over 130 NEW full-color photos and over 40 NEW radiographs bring common and uncommon disease states more clearly to life.